The Mall in Washington, D.C. Is underlain by deep river deposits of very soft silt and clay from the adjacent Potomac River. Approximately 45 feet of soft deposits lay under the site of the planned Korean War Memorial, which is directly across the Reflecting Pool from the Vietnam Memorial. T he project designers decided to use prefabricated vertical wick drains in conjunction with an eight foot high surcharge to consolidate the soft deposits prior to building the monument. Wick drains were placed on five foot centers in a triangular grid pattern. Instead of using a sand drainage blanket, the wick drains were connected to a system of horizontal strip drains to provide atmospheric relief for the wick drains. 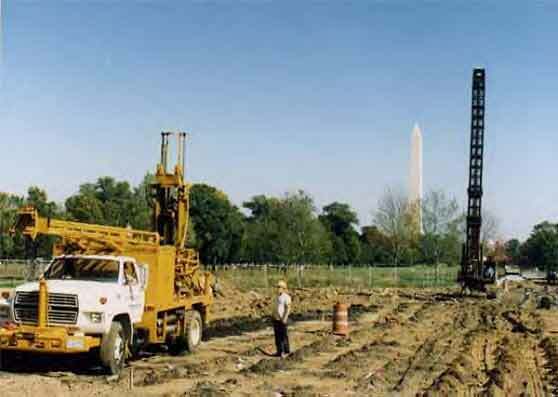 Predrilling of the top 8 feet of portions of the site was required to penetrate shallow fill materials.